Song to the Front (Vietnamese Classics Re-Cut Series), 2011, single-channel SD video, black and white, stereo, 5 min. 14 sec. 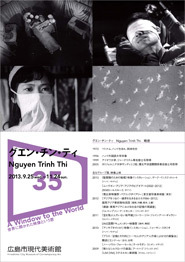 Nguyen Trinh Thi re-edited a historical Vietnamese war film produced by the Vietnam Feature Film Studio, transforming the obscure black-and-white classic into a vignette that deconstructs the melodramatic and romanticized elements of social-realist drama. Bài ca ra trận (Song to the Front) is a propaganda film glorifying the struggles of the proletariat and aimed at drumming up patriotism. By inserting close-ups of key characters – a young soldier, emblematic of the generation who willingly sacrificed their lives on the front lines for their country and the communist cause, and a nurse who cares for wounded soldiers – one after another with unrelated scenery of starry skies or flocks of birds in flight, set to Stravinsky’s The Rite of Spring, Nguyen intentionally obfuscates the old film’s plotline. While leaving things up to the viewer’s imagination, she encourages reinterpretation of the blatantly ideological original work. Nguyen Trinh Thi was born in 1973 in Hanoi, Vietnam, where she is currently based there. She majored in journalism at the University of Iowa and Pacific International Affairs at the University of California, San Diego. While in the United States she was active as a journalist, but since 2005 she has focused on creating documentary films and video art. In 2009, she founded DOCLAB in Hanoi, an educational center and studio for the production of documentary films and video art.